German tourists longing for a taste of home on Lanzarote will be pleased to discover the food stalls at Teguise Market. 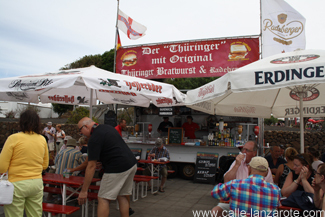 Here, on two stands run by the El Puerto restaurant from Puerto del Carmen, German sausages and other cooked food are served. The sausages are called „Thüringer“, a type of fried pork sausage that comes from the Thuringia area of the former GDR and contains a small amount of spices. A range of beers are also on offer. „What do they do if it’s full?” – the words of Germany’s chef and restaurant tester Christian Rach came to mind as I visited “El Puerto” in the Calle Teide in Puerto del Carmen for the first time. Only two tables – including ours – had anyone at them, and yet we had to wait a whole hour for our food and another 30 minutes for the bill. 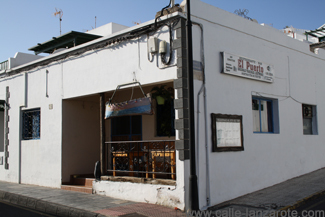 El Puerto is a restaurant that serves German food, so schnitzel and geschnetzeltes have been combined with Canarian influences. Unfortunately, when we visited, the ceiling fans were not working, and during the evening it kept getting warmer. The smell of old fat in my corner of the restaurant didn’t help my first opinion either. Visiting Lanzarote is an interesting situation for me linguistically, as I speak all three of the main languages that you hear on the island: English, German and Spanish. Which language do you speak as a tourist? My rule of thumb is to use Spanish as much as possible – in supermarkets, shops and restaurants. Of course the people serving could speak to me in my mother tongue, but I find it better that way. It can often be to my advantage as well. Some locals are more welcoming if you make an effort to speak their language. At Teguise market you can often get a better bargain for making the effort and an even better one if you are fluent in Spanish. In restaurants the waiter’s English may only extend to taking your order and presenting you with the bill – it may not extend to sorting out complaints. But it can also be very funny, as being able to read all three versions of the menu I often find translations that have gone wrong.